The Skinny: Johnnie To's long-awaited crime film comes stuffed with Milky Way-type style and cinematic contemplation. The end result is less satisfying than some of his more celebrated works (i.e. The Mission), but it's still head and shoulders above most anything you'll find out of Hong Kong. Nowadays, anyway. It took a year to make thanks to numerous starts and stops, but Johnnie To's long-awaited PTU is finally upon us. This return to the crime genre is long overdue for To. Since The Mission in 1999, his filmography has consisted almost exclusively of comedies, the only two exceptions being Fulltime Killer and Running Out of Time 2, though the latter could have been considered a comedy too. PTU promises a return to the films that made Milky Way productions: tough crime flicks mired in and critical of their chosen genres. For awhile there, it seemed that Johnnie To's Milky Way crime films were the only thing worth seeing out of Hong Kong. Simon Yam is Mike, the leader of a Police Tactical Unit (or PTU, duh) that patrols the streets of Hong Kong. One night, he and his squad (including Maggie Siu and Milky Way regular Raymond Wong) happen across Officer Lo (Lam Suet), an anti-crime detective who's been beaten by a group of young triad regulars. Lo's gun is missing, which should be reported, but Lo is fearful that the oversight will have heavy consequences for him. Without hesitation, Mike offers to help Lo find the gun, with the coming dawn as their deadline for success. Unfortunately, the circumstances are more convoluted than they first appear. Lo was beaten by men belonging to gangster Ponytail, but Ponytail has just been assassinated by another party. The obvious culprit would be rival gangster Eyeball, but the accusation is denied. Still, Ponytail's father Bald Head wants revenge, and will use Lo's missing gun to get his way. Meanwhile, Mike and his team conduct their own investigation into the missing gun, but Mike's motives are questioned by various parties, including fellow PTU member Maggie Siu and the obligatory rookie cop. The local members of CID (led by Ruby Wong) begin investigating Ponytail's murder, and soon begin to question Lo's involvement. Plus, a series of broken car windows and some guy at a telephone booth add intrigue to the evening. All these seemingly separate plot threads circle each other before coming together in grand cinematic style. Shots are fired, lives saved or lost, and heroism attained in the most unlikely of ways. Were it not a Milky Way film, this could be the blueprint for your typical noir potboiler. But this is a Milky Way film, which means things are never quite what they seem. Johnnie To explores a variety of genre themescamaraderie, righteousness, and the nature of heroismbut stops short of being definite on anything. Like his most sublime crime film, The Mission, To uses a minimum of dialogue and a maximum of cinematic staging to explore the subjects of PTU. Actions speak more loudly than words, and the criminal world is home to both a stunning ridiculousness (there's actually a hierarchy for seating at hot pot restaurants) and a sudden danger (death, and even life, could be hidden just out of reach). At the same time, the just and the pathetic can exchange places in a matter of minutes, and heroism can be found by sheer luck. Without dialogue or even an overly dominant theme, all of this seems blissfully random, but there is a geniunely enthralling edge to this noir tilt-a-whirl of a movie. Johnnie To keeps things moving with a steadyand deceptively stillpace, and even when the film seems to go nowhere, nuggets of satisfaction are easily gleamed. Which isn't to say that the film is perfect because it really isn't. Perhaps it's unfair to do so, but when comparing PTU to The Mission, it becomes all to easy to recognize one as superior to the other. The Mission found genuine character and drama in the underplayed relationship between five guys, and the amount that was unsaid in that film carried remarkable emotional weight. 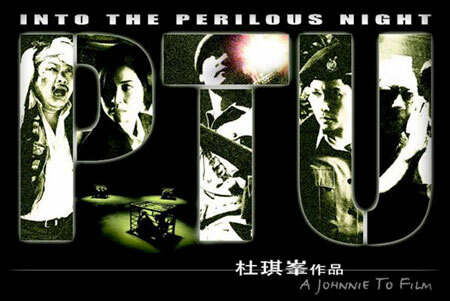 On the other hand, PTU takes a few compelling characters (Lam Suet's Officer Lo) and some not-so-compelling ones (Ruby Wong's CID officer, and pretty much every PTU officer not played by Simon Yam) and creates little that is more than superficially interesting. Some questions are raised, but more often than not, the absurdities and amusing minutiae provide only momentary chuckles. Rarely do we discover more about the characters through their quietest moments, and some sequences (like when Mike and his PTU team explore a dark building) are only interesting as minor gags.